JetLag Genie – October Travel App of the Month! JetLag Genie is a clever app that helps travellers to beat Jet Lag with a customised action plan to help change sleep patterns based on your travel plans. Simply pop in your flight times and destinations, and the app will start prompting you to take a nap, seek dark, or get up a bit earlier in the days before you travel. To help you get into the swing of a new time zone, expect a further five days of prompts to make sure you sleep when you should. It is very definitely aimed at the jet set, but for just £1.99 it is a worthwhile investment even just for one trip. 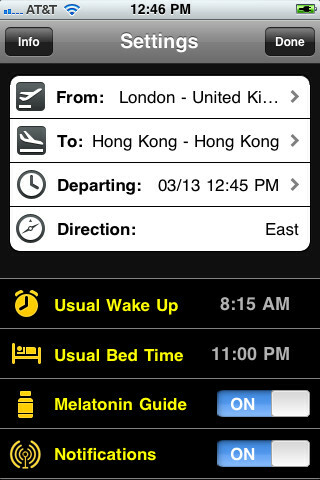 JetLag Genie works on iPhone OS 4.3 or later, iPad and iPod Touch only; there is no mention of coming to Android anytime soon. The app also features a Melatonin guide. Melatonin is a natural anti-jetlag pill, and taking it at the correct times when prompted by JetLag Genie could reduce the effects of Jet Lag further. As is often the case with AppStore purchases, the reviews are thin on the ground. We managed to find several reviews online that claim that JetLag Genie did the job well enough, but there were several that awarded just one star and claimed it was bug-ridden and a waste of time. Release notes do say that several bug fixes have taken place, so it might be worth giving this app a chance! This entry was posted in travel apps on November 1, 2012 by worldwideinsure.